Heating your home costs money, no matter how you do it. Unless you have a wood-burning stove in your home and a forest of trees at your disposal, it requires fuel, the appropriate heat and, in some cases, electricity to power the heater. Kerosene heaters are an old form of heat that is still used today, while propane heaters are growing in popularity because of their reported benefits. How they stack up likely depends on what you need. Propane fuel is much cleaner than kerosene, producing low emissions when burned. This makes it better for the environment. It is heavier than air and is often compressed into holding tanks, which can be purchased and filled at many gas station, grocery stores and hardware stores. 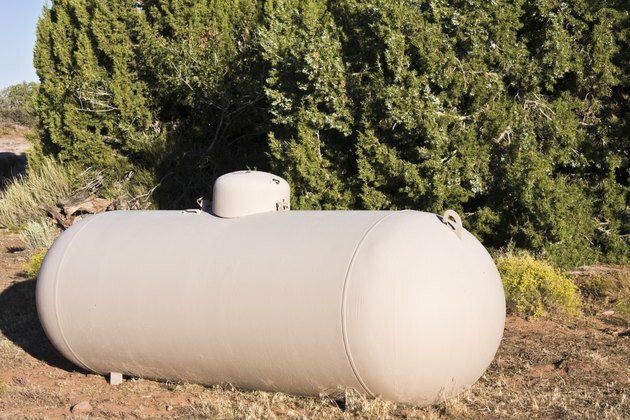 however, propane can also be toxic when inhaled and is highly combustible -- a leak could result in an explosion if the gas encounters a flame or spark. Kerosene is a combustible oil that was developed in the 19th century. It was used primarily to fuel lamps, and today it is used in things ranging from space heaters to jet fuel. This type of fuel is liquid in nature and doesn't pose the same risks of leakage as propane, and while it burns strongly and creates a good amount of heat, it also creates more emissions and is more polluting to the environment. Heat is measured in British thermal units (BTUs). This is an international standard that makes comparing the heat output of various forms of fuel easy. According to the University of Alaska-Fairbanks, kerosene is a more potent fuel source, providing 135,000 BTU in a gallon of fuel. Propane, on the other hand, produces only 91,800 BTU per gallon. The standard cost of kerosene is $2.25 per gallon. Propane costs $3.00 per gallon. When determining how much it costs to produce one million BTUs from either fuel source, kerosene has an enormous advantage, costing just $16.65. Propane costs nearly twice as much at $32.70. This is slightly higher than the cost of electricity, which requires $32.23 on the average, although this can change according to electricity rate changes. If you are looking to heat cleanly and efficient, propane is your best bet -- it is relatively inexpensive, clean-burning and easily found across the country. But kerosene heaters are better as a backup to your home's electricity-powered heating system, since kerosene can be used during a power outage. Kerosene is also less expensive than propane because of its high energy output, but it can be messy to deal with and you may have more trouble finding it.